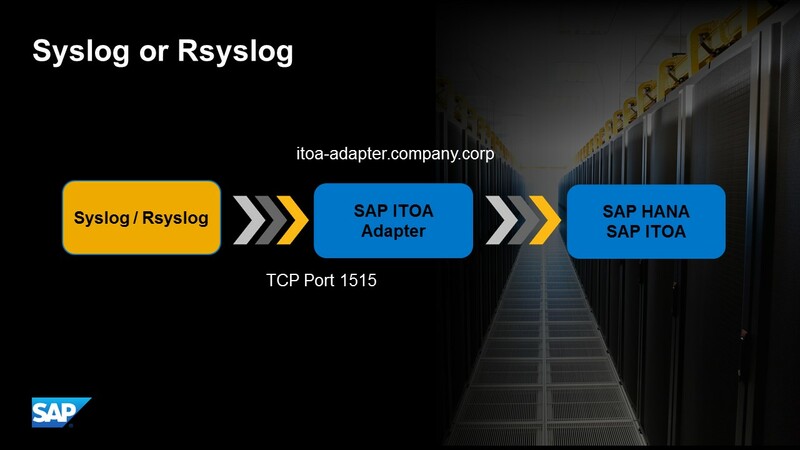 This page provides information about how to forward Syslog or Rsyslog messages to SAP IT Operations Analytics (SAP ITOA). Please check in your environment if Syslog or Rsyslog daemon is in use. The following configuration can be performed in central service (Syslog or Rsyslog server) or in desired instance (end device). Please check this blog for further data source integrations. Before starting with Syslog or Rsyslog configuration, SAP ITOA needs to be prepared to receive Syslog or Rsyslog streaming content. Therefore create a new data source (bucket) in SAP ITOA, activate syslog receiver plugin, define network port & network protocol (TCP or UDP) and start the syslog receiver service. Please add the following configuration in the central Syslog server or desired instance (end device). Login to the instance via console (e.g. PuTTY) with an administration account (e.g. root user). The typical location of the Syslog configuration file is /etc/syslog-ng/syslog-ng.conf. Please check the operating system documentation for further details. Save the configuration changes and restart Syslog service. Check in SAP ITOA user interface weather Syslog messages are received. Please add the following configuration in the central Rsyslog server or desired instance (end device). Login to the instance via console (e.g. PuTTY) with an administration account (e.g. root user). The typical location of the Rsyslog configuration file is /etc/rsyslog.conf. Please check the operating system documentation for further details. Save the configuration changes and restart Rsyslog service. Check in SAP ITOA user interface weather Rsyslog messages are received. Please adjust network card configuration (eth0) to your setup.